Would definitely recommend this watch. Girlfriend got it for me for Christmas. This Joshua & Sons stainless steel chronograph sport watch will infuse a burst of color to your day with its brightly colored numbers and contrast stitching. This timepiece features a Miyota OS20 chronograph movement with oversized case and large pushers. I loved this watch! 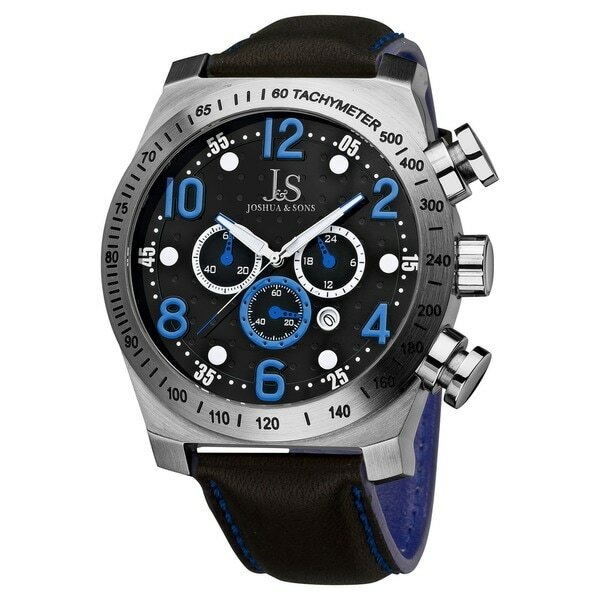 The blue is brilliant against the black and weight is good - this is NOT a flimsy timepiece. It is very stylish and I was pleased to offer it as a gift. It was well packaged and has a nice case. I will be ordering another one as a graduation gift soon. What a bargain! Overstock.com delivers again! A perfect gift, at a fraction of the price seen at my 'brick-and-mortar" store. The quality is as you'd expect, with all the tags on, in the original packaging, ready to present to the lucky recipient. You will want to make note of the dimensions of this watch however: the face is large. If you want a bold, high-quality timepiece - don't hesitate. I think my husband is jealous that we're giving this to someone as a gift...might have to get him one, too (in another color of course!) Love The O! This is my 2nd Joshua & Sons watch and, like the first, it has a large face... is sure to be noticed. Yet, it is comfortable, easily read, and accurate. I will buy another Joshua & Sons watch when the right one becomes available. This watch is absolutely amazing. My boyfriend absolutely loved it. It's such amazing quality that we joke its "indestructible." It's water resistant, and a high quality metal. The blue contrasts against the background is eye catching and the light shines off the metal in pure brilliance. This watch is great looking and well made. My husband ended up exchanging it for a different one only because it is oversized, as is popular style-wise, and overpowering for the size of his wrist and hand. It's from Santa so I haven't actually worn it but it looks fantastic in its beautiful box and it is BIG which is fine as that is my style of watch. Great blue colour. The watch is even bigger then the photo. The quality is very good. I get many compliments on the watch, it is a show piece for sure. I contacted the MFR, they said do not wear it in the shower, due to the leather band, so swimming is out as well. If you like the new watch styles which are huge in design, this one is over the top & nice. This watch looks awsome, can be worn while work and at play! and made me srious sports including diving down to 300 ft. It's just way too cool to write a long review! I can't imagine any guy (or Gal)not having one!! Do not buy this watch. I have gone thru two now and both are defective. Stay clear of this product. I get compliments constantly on this watch...I love watches and this is one of my favorite. I ORDERED THIS WATCH AS A GIFT AND IT WAS WELL RECEIVED AND IT WAS THOUGHT TO BE MUCH MORE EXPENSIVE THAN WHAT IT COST. I purchased this for my younger son's BDay and he was very pleased. But he pointed out that the watch was pretty big but that he will wear it becuase it looks very distinctive and masculine. Bought as a gift. Nicely made, high quality. A beautiful piece of jewelry. The band was nice, and the timepiece itself was EXCELLENT quality. It was well made, attractive, and functional. Got this for a Christmas present and love it. Looks great, good quality, makes a great gift. I purchased this as a Christmas gift for my boyfriend and wasn't sure if he would like or not. He loved it! The face is REALLY big, but looks great on him. It has good weight to it and is very eye catching! A very high quality product. I bought this as a gift during cyber Monday! It's awesome and at a great price! I wish I would have bought more!! "I love to have a blue joshua and sons men's oversized chronograph stainless steal sport watch but you only have the yellow or red. will you have any more blue ones available."